A stunning detached home in this sought after location within catchment for Outwoods edge and Woodbrook Vale primary and secondary schools, making this one of Loughborough's most highly regarded addresses. The property offers a good sized plot with family friendly gardens and parking for several cars. 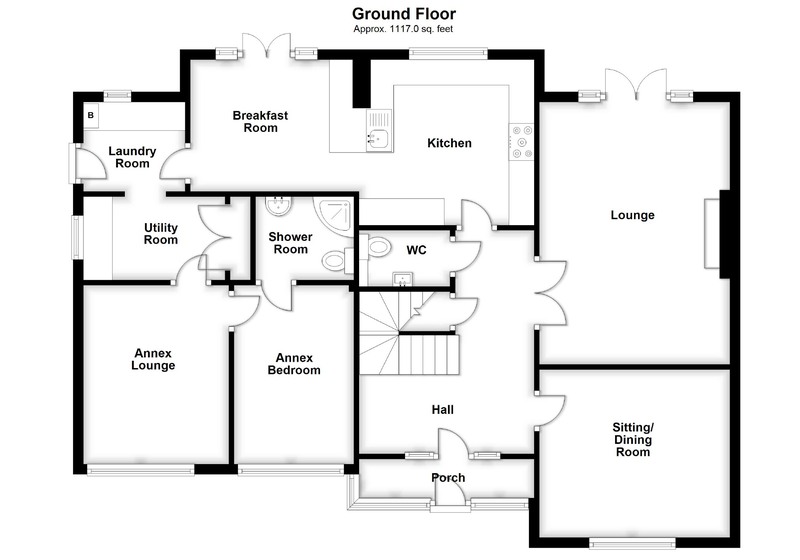 There are four bedrooms with two en-suites and bedroom five/study plus a further one bedroom annex offering a multitude of uses. The fittings are modern throughout and the space and indeed flexibility on offer really does need to be viewed in person to fully appreciate. General Information - Loughborough offers convenient access to East Midlands International Airport at Castle Donington, the adjoining Charnwood Forest and the M1/M42 motorways. Loughborough also offers a fine range of amenities including excellent shopping, schooling for all ages, a wide variety of recreational amenities and regular public transport services by both road and rail to Nottingham, Derby, Leicester, London and beyond. Epc Rating - An EPC (energy performance certificate) has been carried out on this property with the resulting rating. For a full copy of the report visit www.EPCRegister.com and search using the postcode for the property. Front Sitting/Dining Room - 3.75m x 3.30m (12'4" x 10'10") - Having coved ceiling with light point, radiator with cover and UPVC double glazed window to the front elevation. This flexible front reception room can be used as both seating or a dining space as the kitchen offers ample space for day to day dining. Lounge - 5.16m x 3.75m (16'11" x 12'4") - Having a central feature Adam style fireplace with living flame fire inset, coved ceiling with light point and additional wall light points, two double panelled radiators and UPVC double glazed French doors with side screens overlooking the rear garden and decking area. Ground Floor Wc - 1.87m x 1.10m (6'2" x 3'7") - Re-fitted with a modern two piece contemporary suite comprising close coupled WC with push button flush and wall mounted wash basin with storage beneath and mono-block mixer tap, dado height tiling, extractor fan, ceiling light point, central heating radiator and timber laminate flooring to match the hallway. En-Suite Shower Room - 1.9m x 1.61m (6'3" x 5'3") - With a quandrant shower cubicle with full height tiling and electric shower unit, close coupled WC with push button flush, vanity wash basin with mono-block mixer and storage beneath, dado height tiling, contrasting floor tiles, multiple down-lights, Dimplex electric heater and extractor fan to the ceiling. Galleried Landing - With an attractive spindle balustrade overlooking the stairwell and hallway below with two UPVC double glazed windows to the property's front elevation and pendant light point, central heating radiator and smoke alarm, loft access hatch and doors off to all five bedrooms plus the family bathroom. En-Suite Bathroom - 3.61m x 2.06m (11'10" x 6'9") - An impressive room formally a walk-in dressing area and smaller en-suite shower room, this space is ideal for relaxing after a busy day with a five piece suite comprising claw footed bath with central mixer, double sized shower cubicle, close coupled WC and vanity unit with hers & hers wash basins, full height wall tiling, ceiling down-lights and extractor fan, contrasting floor tiles, radiator with cover plus two obscure glazed UPVC double glazed windows to the property's side elevation. En-Suite Shower Room - 1.65m x 1.69m (5'5" x 5'7") - Having a three piece modern white suite comprising fully tiled shower cubicle, pedestal wash basin and close coupled WC with the remainder of the room having mosaic style tiling, contrasting flooring, central heating radiator, extractor fan and ceiling light point plus obscure UPVC double glazed window to the side elevation. Bedroom Three - 3.76m ave x 3.69m max (12'4" ave x 12'1" max) - With areas of sloping ceiling, this characterful room is a good size double with radiator, ceiling light point and UPVC double glazed dormer bay to the property's front elevation. Bedroom Four - 3.02m x 2.57m (9'11" x 8'5") - With timber laminate flooring, UPVC double glazed window to the rear elevation, central heating radiator and ceiling light point. Bedroom Five/Office - 2.53m x 2.52m (8'4" x 8'3") - With UPVC double glazed window to the rear elevation, central heating radiator and ceiling light point. 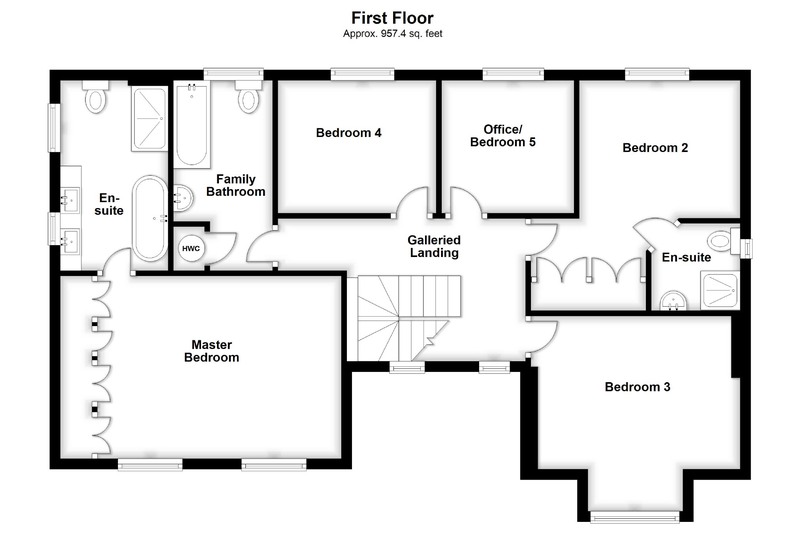 A spacious fifth bedroom or office. Re-Fitted Family Bathroom - 3.65m x 1.89m (12'0" x 6'2") - Incorporating a built-in airing cupboard with pre-lagged cylinder and linen shelves and having a three piece suite comprising panelled bath, close coupled WC with push button flush and vanity wash basin with mono block mixer and storage beneath, dado height tiling to parts, towel radiator, shaver socket, ceiling light point, extractor fan and obscure UPVC double glazed window to the rear elevation. Rear Garden - The rear garden is a generous size by modern standards and has a good sized lawn to centre and gravelling plus shrubs, plants and small trees to the boundaries with two decking areas, one to the immediate rear and one to the far corner of the garden which is mainly fenced to the boundaries and enjoys sun throughout the day. Plot Plan - This plot plan shows a rough approximation of the property's plot and does not point out exact boundaries and cannot be replied upon. Purchasers should make their own enquiries via their legal advisor should they wish to know exact boundaries.